ICICI Bank has quashed rumours of favouritism, nepotism and quid pro quo. The bank clarified that while Chanda Kochhar was on the credit committee, she was not the chairperson. Videocon Chairman Venugopal Dhoot said there was no impropriety in the deal. IMAGE: ICICI Bank's Chanda Kochhar. Photograph: Reuters. Deepak Kochhar, founder of wind energy company NuPower Renewables, has been in the eye of a storm over his company’s relationship with Videocon group, which received a loan in 2012 from ICICI Bank, headed by his wife Chanda Kochhar. Videocon group, also a NuPower investor and financier, has now become a non-performing asset for lenders, including ICICI Bank. ICICI Bank came out on Wednesday and Thursday to quash rumours of favouritism, nepotism and quid pro quo. 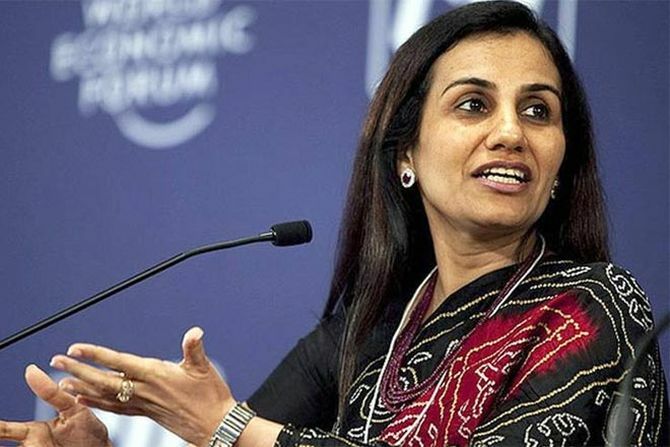 The bank clarified that while Chanda Kochhar was on the credit committee, she was not the chairperson. Both Chanda and Deepak Kochhar were batch-mates in Mumbai’s Jamnalal Bajaj Institute of Management Studies. Deepak, a self-described financial services professional, has kept a low profile over the years, except during his years at NuPower since 2008. This was the first energy business that Deepak Kochhar set up. He has not been associated with any related ventures in the past. Even so, NuPower gathered pace in 2012 as it raised Rs 3 billion from Singapore-based private equity firm Accion Capital Management in exchange for an undisclosed stake. The same year it borrowed Rs 7.5 billion from Punjab National Bank, according to public reports. Then, according to the company's website in 2016, Kochhar said that NuPower was looking to raise another $300 million in two equal tranches to develop 1 gigawatt (GW) of capacity over the next six years. After that the company's news page goes silent with no announcements for the last two years. However, Kochhar, who was being paid a salary of Rs 35 million for financial years 2013-14 to 2014-15, did not take any salary the following year. He stepped down as managing director in April 2016 while retaining his position as a director. The churn in the firm’s management continued, with more people leaving. At the same time, the company also saw two company secretaries leave -- Chandrachud Paliwal resigned in 2016, and Haresh Solanki in 2017. Director Mahesh Chandra Punglia resigned in 2017 citing personal reasons. Business Standard tried to reach NuPower over email and phone listed on its website. "Our office is closed for next two days, we will get back to you on Monday," said an emailed response in what may have been an automated one. The office phone was disconnected as soon the nature of the query (media questions) was announced. So what made Kochhar start a wind energy company and not something in, say, financial services, which he had both the training and experience in? Devesh Bhargava, a former banker who is now an energy industry consultant to both private and government entities, says that the wind energy business is attractive for a number of reasons. "The set-up cost runs in Rs 50-60 million per megawatt and on a 70 per cent debt and 30 per cent equity structure, it should be able to pay back loans easily in seven years." Bhargava adds that for such wind turbines whose life cycle is around 20 years, a firm is generating annuities with very little costs other than annual maintenance contracts that typically don't run more than Rs 1 million a year per unit. Add to it the fact that it needs a tenth of the land solar projects do, combined with tax-free government incentives and that it is a viable business model not requiring a constant involvement. Amit Kumar, PwC India’s partner and leader of the energy renewables practice says though the solar power industry has fared better than wind energy over the past three years, that might not be the case going forward. However, he cautions: “An exit in today’s environment hinges on whether existing PPAs (power purchase agreements) are robust enough and more importantly if there’s enough cash with interested parties to pay the right price,” he adds. According to NuPower’s website, its operations are running across Maharashtra, Tamil Nadu, Karnataka, Rajasthan, Andhra Pradesh, and Madhya Pradesh. It has an installed capacity of 200 Mw of wind projects in operation, and an additional 500 Mw in the pipeline. Typically, wind energy zones are more profitable and the entire wind energy business is about scale. Analysts who declined to be named said NuPower hadn't managed like ReNew Power with its 2-Gw capacity. In the past three years, the company’s financial results indicate that its long-term debt remained stable at over Rs 8 billion, with steady growth in its top line. In FY17, NuPower had a total revenue of Rs 2.10 billion, a 28.6 per cent year-on-year increase. While its interest also remained at the same level in the past two financial years, its net loss reduced significantly from Rs 1 billion in 2015-16 to Rs 70 million in 2016-17. Besides the questions on the financial transactions, there also are questions on operations that beg answers. Why did Kochhar step down from the position of MD at the beginning of a financial year when the company was showing signs of turning around? And, if Kochhar isn’t the MD according to its regulatory filings, who is running the show?